Chandigarh, February 20, 2017:Today Microsoft and Flipkart, India’s leading marketplace, announced a strategic partnership to provide consumers in India with the best online shopping service. As a first step in the broad collaboration between the two companies, Flipkart will adopt Microsoft Azure as its exclusive public cloud platform. Microsoft CEO Satya Nadella and Flipkart Group CEO Binny Bansal announced the news today at an event in Bangalore. “Flipkart has always been committed to its vision of transforming commerce in India through technology. 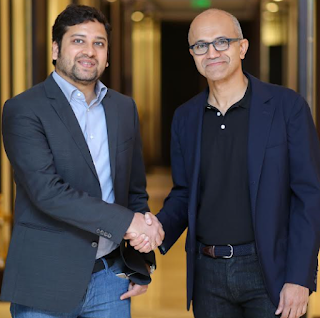 Given Microsoft’s strong reputation in cloud computing, coupled with scale and reliability, this partnership allows us to leverage our combined strength and knowledge of technology, e-commerce and markets to make online shopping more relevant and enriching for customers,” said Binny Bansal, Group CEO and Co-Founder, Flipkart. Launched in October 2007, Flipkart is known for its path-breaking services like Cash on Delivery, experience zones and a 10-day replacement policy. Flipkart was the pioneer in offering services like In-a- Day Guarantee (50 cities) and Same-Day- Guarantee (13 cities) at scale. With over 1,00,000 registered sellers, Flipkart has redefined the way brands and MSME’s do business online.